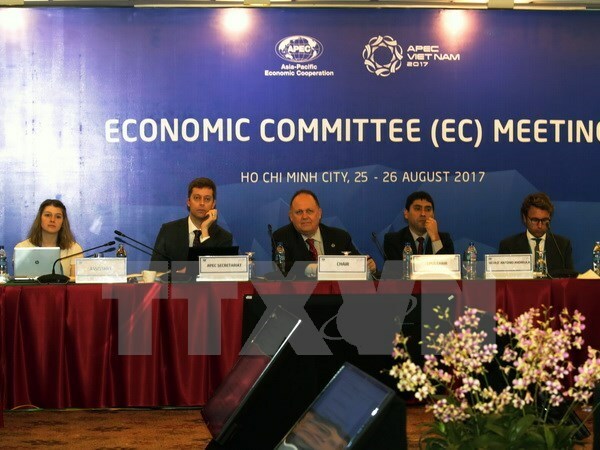 HCM City (VNA) – Delegates to the third APEC Senior Officials’ Meeting (SOM3) and related meetings, which are scheduled to conclude in Ho Chi Minh City on August 30 after more than ten days of working, have applauded Vietnam’s hosting of the meetings and APEC Year 2017, as well as the country’s initiatives. Rory McLeod, Chair of the APEC Economic Committee (EC), said the organisation by Vietnam in 2017 has been super with well organised meetings and really good venues. Valery E.Sorokin, Ambassador-at-Large, Senior Official of Russia for APEC, said that Vietnam has done an excellent job as APEC Year 2017 is going very well and smoothly. “The spirit of collaboration and search for collective actions and consensus are there,” he said, expressing his firm belief that there will be sound and practical debates during the ASEAN Economic Leaders’ Week in the central city of Da Nang in November. The country’s strong chairmanship, very good logistical support and clear agenda during the SOM 3 and related meetings help move APEC economies forward in preparation for the leaders’ meetings in Da Nang, he said. Ambassador Robert Holleyman, President and CEO of C&M International, LLC, said Vietnam’s hosting of APEC this year is a big signal that the country wants to integrate with other economies in the region. “Vietnam’s priorities in general are about helping continue this big story about regional economic integration and getting benefits from trade, but also now making sure that they happens all around the region and not just to some economies or for some people,” he said. “Some of the priorities are quite new for us and it’s a big challenge, but Vietnam has really focused us all on that,” he stressed. EC Chair Rory McLeod also held that themes and priorities for APEC 2017 are very clear, ambitious and useful for APEC. Meanwhile, Tsutomu Koizumi, APEC Senior Official of Japan, said at APEC 2017, Vietnam has provided excellent agendas and priorities, hailing the country’s efforts to enable APEC officials to do a good job. “We started to think about the so-called "possible goals of 2020". What APEC needs in future is to promote economic and investment cooperation within our region in order to inspire the rest of the world about what could be possible in terms of global prosperity. I think Vietnam had the excellent idea of establishing a so-called APEC Vision Group gathering persons from APEC economies to think about, promote and ask senior officials to establish possible goals,” he said. Canadian Ambassador MacArthur said the four priorities raised by Vietnam are aligned with these of the Canadian Government, stressing that the country’s ideas have helped other APEC members move forward in terms of economic development.